The Loch Ness Monster on Google Earth? The Loch Ness Monster has remained nothing but a mystery for decades, with sightings that have ended up as nothing more than fakes. But this time, Jason Cooke of Nottingham, England believes that he has spotted the monster on Google Earth saying that "it's just like the descriptions of Nessie." 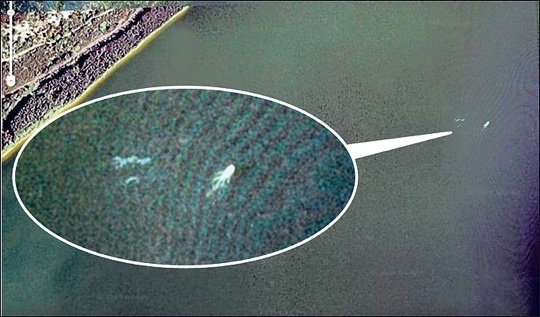 News around this image of a large object resembling some sort of sea-creature (Whether it is or is not the Nessie) have excited researcher Adrian Shine, of the Loch Ness Project. He told The Sun: "This is really intriguing. It needs further study." Since the last sighting of Nessie over a year ago, speculations that climate change may have killed the Loch Ness Monster were made. But now that there is a possibility that this grainy, squid-like figure is Nessie, then Hurrah for it lives! And my childhood dreams of swimming with the Loch Ness Monster (Or maybe even having one as a pet?) are not all lost! Now why didn't anyone think of using Google Earth in the first place? Have a look: Enter the coordinates Latitude 57°12'52.13"N, Longitude 4°34'14.16"W in Google Earth and maybe it's still there.